This past weekend was a crazy one. Mr. Cowboy and Big Cowpoke left on Friday to go to a cub scout camp out. They were so excited. It was a great weekend to go. The weather was 80 sunny and dry. Which is weird for Louisiana. Little Cowpoke was all upset because he wanted to go camping outside. But little brothers were not aloud to go camping. Little Cowpoke and I set up a the shark tent in the living room, so we too could go camping. The next day all Little Cowpoke could talk about was going to go pick up Big Cowpoke and Mr. Cowboy. He really wanted to go camping. 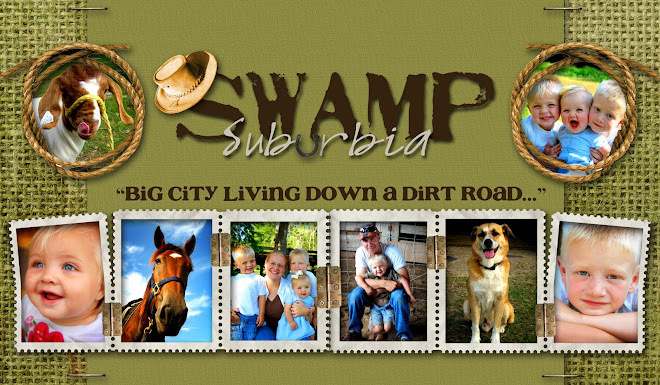 But later on in the afternoon a few cousins came over to ride dirt bikes and Little Cowpoke soon forgot about camping. 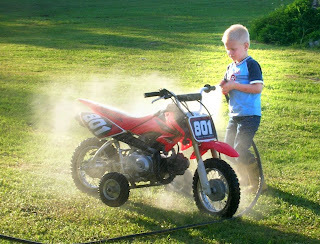 We tried to teach Little Cowpoke how to drive the little 50 dirt bike (it has training wheels on it). This is what it looks like. This is Big Cowpoke washing it after a ride. But Little Cowpoke was not a good driver, he ran into our flowerbeds and crushed two flower bushes. Now, if Mr. Cowboy ever found this out he would be so mad at me. But he never reads this so I think I am safe! After Little Cowpoke decided he didn't know how to drive we just took him for rides on the little 50. He was loving it. The weekend was going great. All the kids were riding dirt bikes, there were four of them out here. We have 20 acres and a big 15 acre pasture that the kids were riding on. Then it was time to feed the horses. The kids were taking a break from bike riding and so I wanted to get in some riding time. So, Paw Paw and I went out to the barn and tacked up (that means saddled) three horses. I was going to ride two. Paw Paw beat me to the round pen with is four year old mix horse. Let me tell you a bit about this horse. I wish I had pictures of her. She is weird. She is a Tennessee Walker mix of some kind. Sorry to all you walking horse fans but I think they are funky looking horses. Tall, skinny, with funky heads and ugly tails. See the high head position and the tail thing going on there? 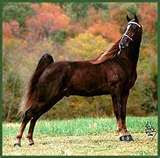 This is just an example of a Tennessee Walker. They are good horses and a nice breed but just not my favorite. But that is just my opinion. To each his own. 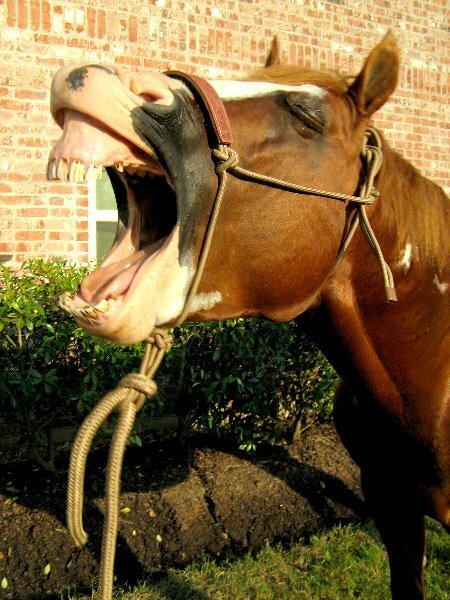 But anyway Paw Paw was working this crazy horse in the round pen. It was running fast and being normal, I guess. 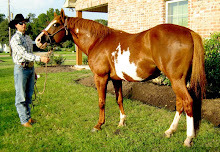 *Just a quick note, the day before when Paw Paw was riding this horse it got scared and he fell off of it. * Okay now back to the story. Then he put my two year old on it's back. I was talking to a friend at this point and said, "Wait.....don't start the dirt bikes until Little Cowpoke gets off the crazy horse." Just then the horse went kinda crazy. Little Cowpoke held on for a bit but then he couldn't anymore and he fell to the ground. The horse then stepped on him three times and finally she was about to step on his chest when Paw Paw got her away. I was running over there but just couldn't get there in time. I grabbed him and ran. We went to the emergency room. He had a bunch of x-rays and some head scans done and he was okay. No broken bones. A lot of bruises and some burns from the horse's hooves, but he was okay. The doctor did say that he wanted to keep him over night because his stomach and intestines were swollen. So, Little Cowpoke and I got to have a hospital camp out. He was excited we were going to camp out. Little Cowpoke was a trooper. The next morning he was running around and playing just fine. He was excited to show is big brother his cuts and bruises. Boys. He is a real cowboy though. He went out to the barn yesterday and played while we fed the horses. He also tells us that he will only ride Pearl. He is a smart boy. I have been trying to convince Paw Paw to get rid of that horse. They bought if for an 12 year old boy to ride. I told them they need to find an older horse that has been there and done that. But nobody will listen to me, what do I know anyway? I don't have an Equestrian degree or anything. I didn't major in hores and I just don't know a thing. Oh, well. I just wish they wouldn't drag my kids into the whole unbroke horse world. Maybe some better judgements next time. Poor guy! I'm glad his Paw-Paw got to him in time to prevent any more injuries. Sorry you had to spend the weekend in the hospital, but it's good to hear that he is okay. I swear little kids are much tougher than grown-ups. Good heavens - so glad he wasn't hurt! I'm with you on the Walkers. My mom has ridden nothing else for years and I still can't stand them. They're not very smart either. But maybe that's just the ones she gets. All I can say is In-laws. Sheesh. Poor guy. Glad he's ok!